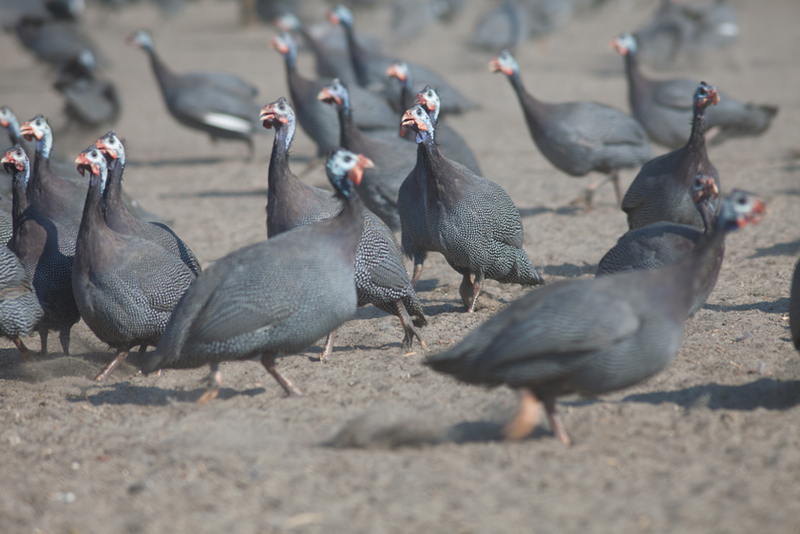 Label Rouge traditional guinea fowl have firm, darkish flesh that is reminiscent of game meat. They are reared either free-range or in a perchery to satisfy their need for freedom, which is one of their main characteristics. Hardy breeds, selected for the quality of their meat and their slow growth. Guinea fowl are raised in little flocks in small, well-lit poultryhouses in natural daylight (400 m² maximum). The maximum stocking rate inside the poultryhouse must not exceed 13 guinea fowl per m². Or in percheries over 2m high and at least twice the size of the poultryhouse. At least 70% of their feed during the fattening period must be of cereals and cereal based products. Label Rouge traditional guinea fowl must be at least 94 days old before they are slaughtered. Label Rouge traditional guinea fowl are classified class A (European standard pertaining to external appearance) and must therefore be perfect in terms of their presentation. As ready-to-cook fowl, their mean weight ranges from 1 to 1.4 kg. They can be presented partially eviscerated (with giblets), ready to cook, or cut up into portions.